A gentle renewing shampoo that rehydrates, nourishes and protects dry and damaged hair. 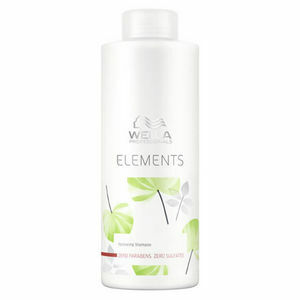 Wella Professionals Elements Renewing Shampoo is a sulphate-free product that renews the moisture of the hair, preserving and nourishing it from root to tip. It forms a part of Wella's "free of" care system that instantly repairs and prevents against keratin degeneration. It boasts a luxurious foaming experience and cares for your clients' locks being gentle enough to use every day. £15.54 (inc. VAT) Why no VAT? We're a trade wholesaler and quote our prices without VAT to help our VAT-registered customers understand the true cost of a purchase. A gentle and lightweight conditioner that works to strengthen each strand of hair from within, repairing and protecting. Fabulous intensive restorative mask that intensively restores and preserves the natural inner structure and strength of your clients' hair. Comes in a 500-ml pot. Designed especially for 1-litre, salon-sized bottles of Wella Professionals shampoo and conditioner. Makes for easy dispensing at the backwash.